American Chris Daria, RAAF Base Laverton: Spitfire. He bought it new in the UK. John Dows, Albury: 1976 Dolomite Sprint. Roger Makin and Pam Baker's Stags were both bought from the same dealer. Lindsay Gibson: 2.5PI. His 2.5 PI has been in the Gibson family since new, bought new in 1970 by his father, he took the car over when his Dad died in 1977. Brian Tink, ACT TCC: 2500S. Max Blyton, ACT TCC: 1968 TR5. Phillip Ruddock, Politician, Canberra: 1969 2000 MK2. Ronald and Denise Mills have owned their Stag since 1980 and it has covered 494,500 kms on the original engine. Graeme Oxley is the second owner of his Fireball Red 1975 2.5PI since May 1996 and as of the 15th June 2016 it has covered 661,300 kms. Engine was rebuilt in 1998 by General Sporting to TR6 Spec of 150+ BHP. In 1999, Greg Tunstall QLD fitted manual overdrive box and power steering and adjustable 2500S front suspension including stabiliser bar. Errol and Margret Bowes in Perth are the second owners of their Marina Turquoise 1969 Mk1, buying it for $2960 on 17 June 1970. The engine was rebuilt and the body resprayed Ice Blue in 1992 when a Mk2 interior with high seats was fitted. Later, because of health reasons, an automatic gearbox replaced the original manual. It was their daily runner until 1984 when that task was taken over by a 1976 Sebring White Triumph Mk2 TC. 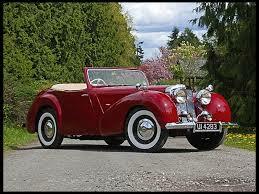 Click the image of the magnificent 1949 Roadster below to view a comprehensive PDF file for most post WW2 Triumph Models.